BRAZIL’S federal police are asking that corruption charges be brought against President Michel Temer, which could lead to his suspension from office. 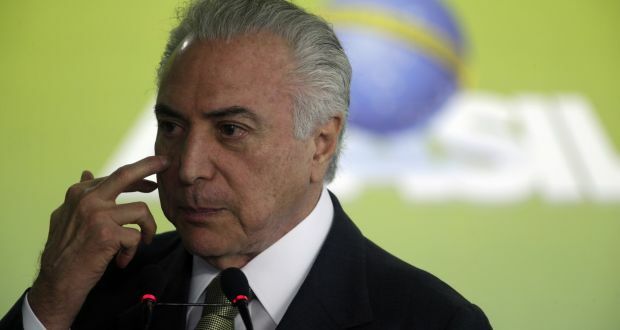 The report said an investigation had obtained evidence that Temer pocketed about $300,000 in bribes from construction giant Odebrecht, which is at the heart of a regional corruption scandal. Temer has survived two previous attempts to charge him. A federal police report says it has evidence the unpopular leader received bribes from construction giant Odebrecht, which is at the heart of a regional corruption scandal. Brazil’s top court said it received the report Wednesday. The report will be sent to Attorney General Raquel Dodge, who will decide whether Temer should be charged for the third time since taking office in 2016. If she chooses to proceed, two-thirds of the Chamber of Deputies would have to vote to suspend Temer and put him on trial. The body twice rejected previous charges against him. Temer’s term ends Dec. 31.